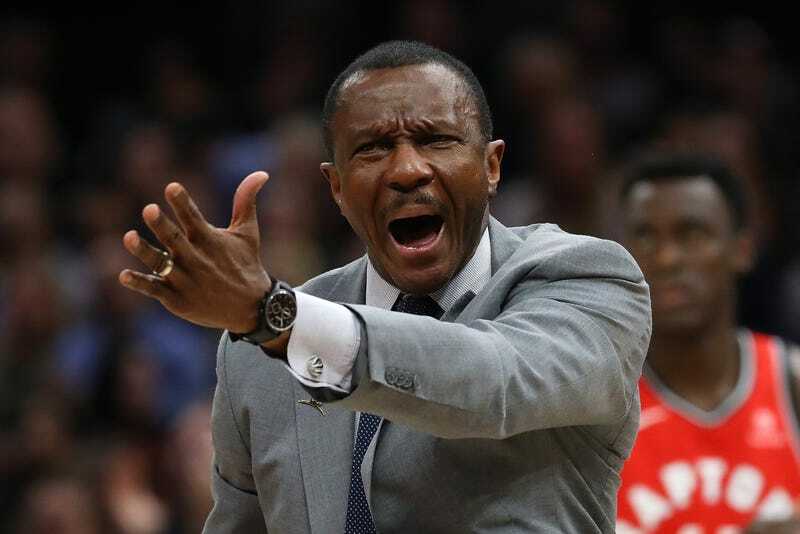 Head coach Dwane Casey of the Toronto Raptors reacts while playing the Cleveland Cavaliers in Game 3 of the Eastern Conference semifinals during the 2018 NBA Playoffs at Quicken Loans Arena on May 5, 2018, in Cleveland. After compiling the best record in the NBA Eastern Division, the Toronto Raptors have fired head coach Dwane Casey. Casey was informed Friday morning that the team, which suffered a disappointing second-round-playoff sweep by the Cleveland Cavaliers, was moving in another direction. According to ESPN, Casey was the winningest coach in the franchise’s history and a good money bet for Coach of the Year in the NBA. “The Raptors set a franchise record with 59 regular season victories and earned the East’s No. 1 seed before advancing to the Eastern Conference semifinals after a 4-2 series victory over the Washington Wizards,” ESPN reports. Casey helped turn the Raptors into a juggernaut during the regular season that ultimately flamed out in postseason play. ESPN notes that Casey probably won’t be unemployed for long, since his departure from the Raptors makes him the most attractive head-coaching prospect on the market. No word on what Drake thinks about the move.